Just a quick post from the intersection of Indian Summer and Fall, also known as the “layering season.” The mornings are cool and often require a sweater, sweatshirt, or jacket, but odds are you’ll forget those at the office or school because by the end of the day, the temperature will have soared into the 70s or even higher. Prue* has been putting the top down on the car in the sunshiny afternoons but by dusk it’s time to button up for the drive home. In this time of transition, we are still seeing bright colors of summer here and there, alongside the appearance of gold, bronze, and an abundance of orange. We love this little driveway lending library on our walking circuit. And the yards are transforming, in very peculiar fashion. I haven’t decided exactly how I feel about this. It looks somewhat ominous. October was a temperature roller coaster in Louisville this year. Yes, it got seasonably cool but the mercury went right back up into late spring/summer temps for several days. Consequently, fall has been gradual and extended this year, and I am grateful. 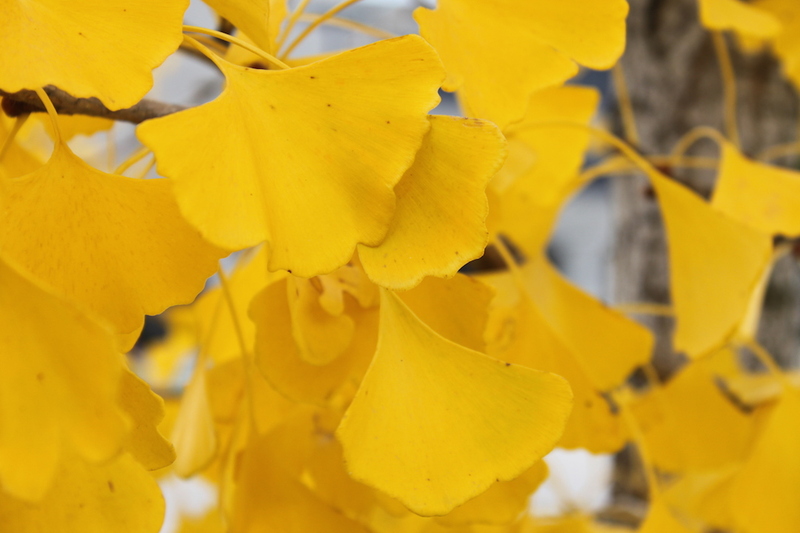 I’d seen some gorgeous ginkos not far from my home last year but missed getting pictures. The fact that the ground was pretty wet and the sky a bit gloomy on Friday didn’t dampen my joy at finding these beauties at peak. No photos can do justice to the real thing but here are my tries from last week.